Between more satisfying and intensive sewing projects I like to sew practical things, since I dont really enjoy them that much and need the leftover sewing mojo from good projects to power through the practical stuff. I made this iphone armband thing so I dont have to hold my phone in my hand when i go running (yes I did that for a while). I drew out how I made this. There’s a reason i am a seamstress and not a comic stripe artist. Please note that I did not provide any measurements – I just sew and tried on as I sewed so that it will be as tight and secure as possible. Leave a comment if you have any questions. If you made yours from this tute, please leave a comment and let me know! p.s. the “window” is made similarly to my wallet here. 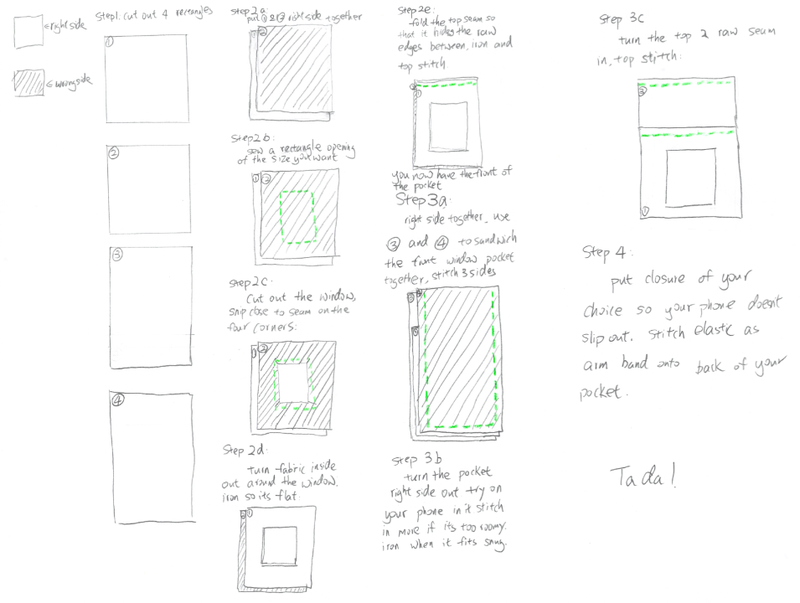 This entry was posted on Tuesday, August 13th, 2013 at 11:00 am	and posted in finished pieces, how to. You can follow any responses to this entry through the RSS 2.0 feed.